The 2018 trip from 8th to 10th July took 54 members and friends to Rosslyn, Edinburgh and Jedburgh and, in keeping with this summer, the weather was fine, dry and warm. 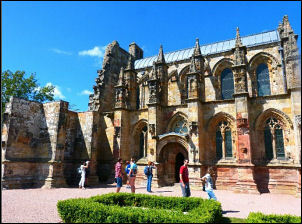 After a brief stop at Gretna Green, we arrived at Rosslyn Chapel in the early afternoon. The success of Dan Brown’s “The Da Vinci Code” has made the Chapel one of the most popular tourist sites in the country. We were there to admire the majestic stonework of 15th century master craftsmen. This was helped by a talk from one of the guides which introduced us to the symbolism used by the stonemasons. We stayed at the Novotel Edinburgh Park Hotel and this gave us a chance to see the Edinburgh trams. This was a controversial project which at one time seemed likely to be abandoned. 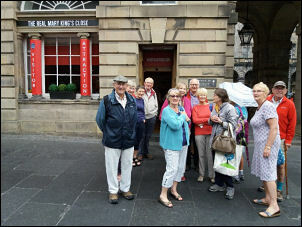 On Monday 9th July our coach took us into Edinburgh and collected us again at the end of the day. Our first visit was to The Real Mary King’s Close. We split into three groups for a tour of the 17th and 18th century underworld led by guides who had taken on actual period characters. Life was pretty sordid in the densely built high rise closes. When we re-emerged above ground, lunch was taken around the Royal Mile and opportunities were taken to see other sights including, St. Giles Cathedral, the Camera Obscura and the Castle. After lunch we came together again at the National Museum of Scotland which was a short walk away. Once again we split into three groups and each was led by a Museum Guide. We had asked to see some of the highlights of the Scottish History and Archaeology galleries. 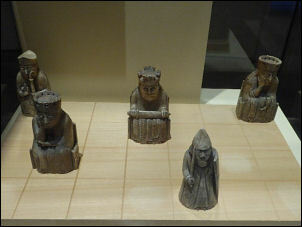 These included the Pictish Hilton of Cadboll Stone, Iron Age Gold Torcs, the Roman Cramond Lioness, and the Lewis Chessmen. We were particularly impressed with our guides’ knowledge and preparation. This writer’s favourite was the wonderful torcs which had been created by skilled workmanship. The following morning we headed off to Jedburgh which is in the Borders. Our first stop was at Jedburgh Abbey. This time we put on headphones for our guided tour. 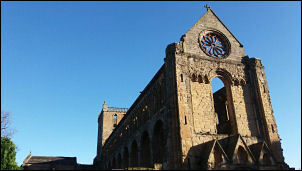 The Abbey looks impressive from outside but it is truly an imposing, towering ruin. After lunch we split into two groups to visit the Mary Queen of Scots Visitor Centre and the Castle Jail, both in Jedburgh. This was facilitated by our ever helpful coach driver, Stuart, who shuttled us across town. 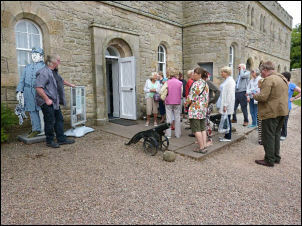 The visitor centre was where Mary stayed in 1566 and our guide described the story of her turbulent life. The Castle Jail was built in 1823 and was in its time a model prison, taking on board the ideas of John Howard, the prison reformer. We were met by a guide who gave us a summary of the jail’s history, leaving us to explore the women’s wing and the House of Correction. We returned to the coach at about 4pm to start the journey home, travelling through Hawick and the beautiful borders.